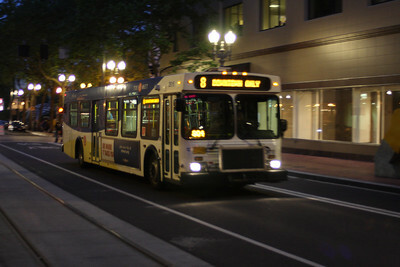 I finally had a good photo outing on the downtown bus mall here in Portland. 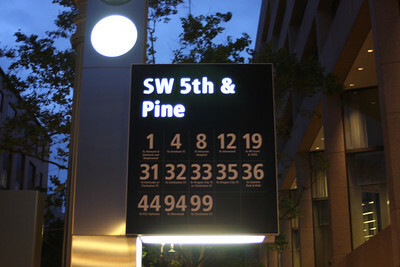 Started out with the semi-reliable, and very useful Transit Tracker. 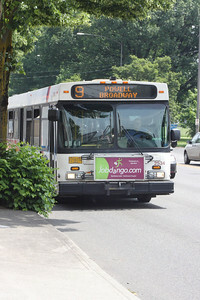 At two minutes I walked over to the stop and sure enough, here comes the #9 headed for downtown. 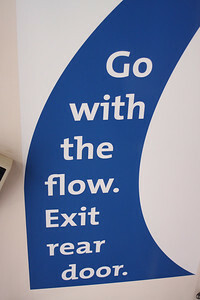 Since a lot of people seem to be complete illiterate fools that like to delay buses, slow down progress, and generally get in the way I follow the "Go with the flow. Exit rear door." 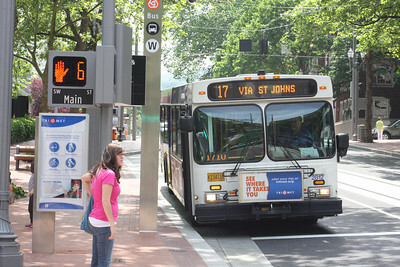 Took a shot of my downtown stop, the #9 zipped away and a #17 pulled in as I got the photo. Smooth flow during rush hour went well, as it has been going. Even though in the above shot I said rush hour, but really, it was about 3pm "ish". 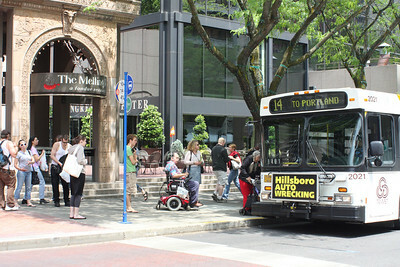 But as always with TriMet downtown is generally always busy during the day. 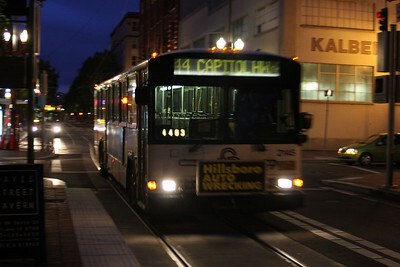 I got a few more bus mall shots when the sun ran away from the sky and I escaped from a productive day of work. 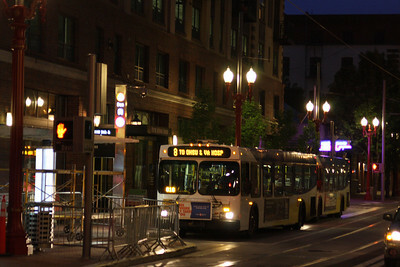 This is about 8:45pm and there is still steady ridership flowing on and off the buses. Here two are stacked up at a stop on the north stretch of the mall. 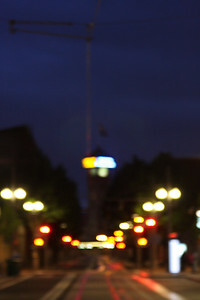 A little bit of an artsy shot of the mall looking toward Union Station. A clear shot looking the other way. 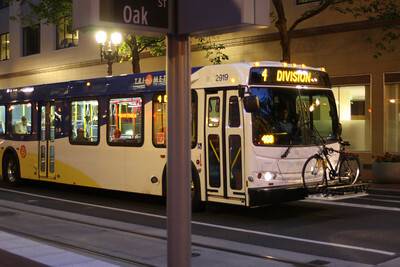 #4 Division bus using one of the new TriMet Buses, a rarity since it is an east side only line. Yup, another artsy shot. 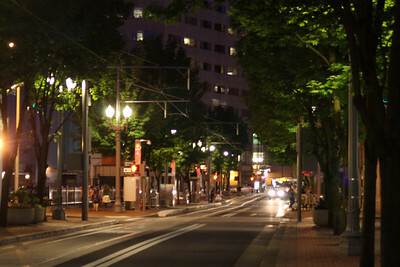 Anyone guess what street this is? Another display of people’s illiteracy, more of non-Portlanders than Portlanders. I also must say it is evidence people do not know nor follow most of the rules of driving. Double whites YOU DO NOT CROSS IN ANY FREAKING STATE PEOPLE!! 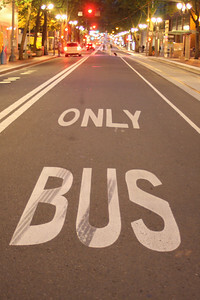 If something says Bus Only it means Buses Only! How is that complicated Mr. & Mrs. California, Mr. & Mrs. Suburbanite, Mr. and Mrs. Washingtonian! Seriously, out of the almost 2000+ tickets TriMet has handed out almost ALL of them are for people not from Portland. I don’t know about you, but that is fairly solid evidence that at least Portland drivers pay attention. Last but not least, one of my top 3 stops. Why you might ask, it’s near Stumptown on 3rd. :) I practically live at that place (and Stumptown). With the bus mall rearrangement it might actually decrease my usage of both places by about 5-10% because they’re 2-3 blocks further than the 1 block they where previously. Eventually I’ll get it figured out. Also, I think in general drivers are lax about following the laws and society isn’t as strict as it could be at enforcing them. Its not totally clear what the rules are on the mall (for example, there’s generally no signs near the left side traffic signals when there’s overhead signals, and its not written in the driver’s manual what the "(T-like symbol)/BUS" means) but even when things are clear people don’t follow them. I just saw somebody turn left from southbound Interstate onto Oregon (at the east end of the Steel Bridge) right in front of a "NO TURNS" sign between the two signals. 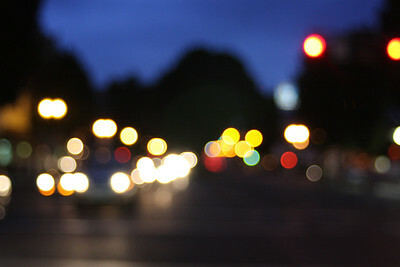 It could be that when drivers want to turn, they focus on turning and not looking for signage to see if its legal. Yeah, I assume that is true about laws and society. Then of course, I don’t entirely blame the police. Most laws are crap, and most of the time people aren’t brought up for a solid, reliable, personally accountable, disciplined people any longer. Sometimes though, the police should really just lay into people, especially when it is merely a monetary ticket. I’m putting this up on my blog! 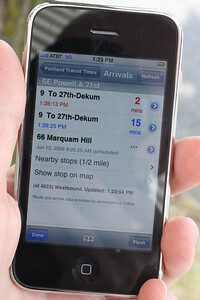 what iPhone app is that for the transit tracker? Or is it just an iPhone optimized website? 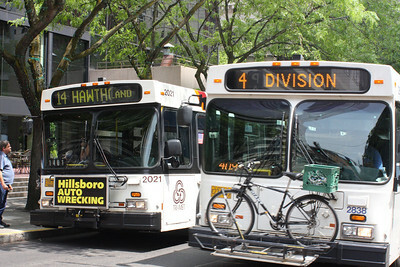 The app is called PDXBus. It’s been a pretty solid app. It appears to be an IPhone interface and not merely a web page. I dig it, haven’t found a need to use the website directly via phone ever since I got the app.